1. You burn 30 per cent more calories! Running on sand makes you work harder. With each stride, your feet sink a little, forcing you to exert more energy than running on tarmac, and burning around 30 per cent more calories. 2. 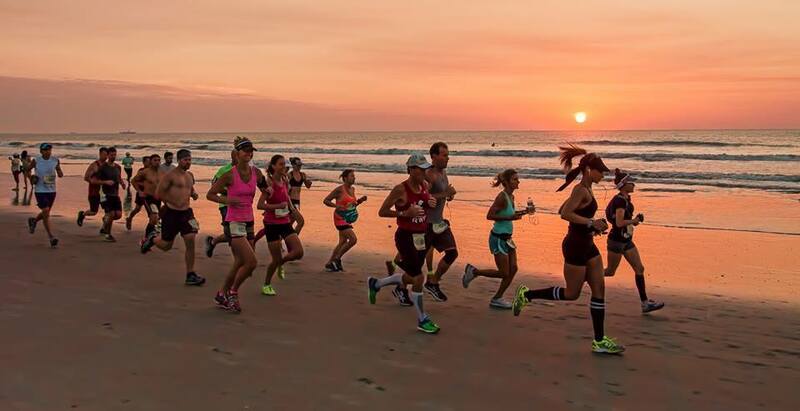 Regular sand running can help prevent injuries! 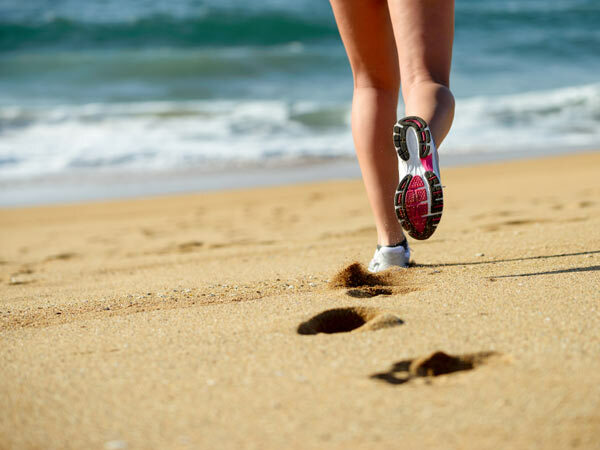 Running on sand without trainers forces your smaller, stabilising muscles in the knees, ankles and feet to work harder than running on roads. Therefore, continual beach running and strengthening of such muscles may help to prevent common road injuries. 3. Beaches are a natural assault courseTo put your agility to the test, jump over small piles of driftwood or pools of water, and race the incoming tide for short spurts of speed work. ​4. Give your joints a break. A study by Griffith University, in Queensland, Australia, found that landing on soft sand increases the time in which our feet sink into it. The overall stress of pounding on the lower joints, such as ankles and knees, is reduced. 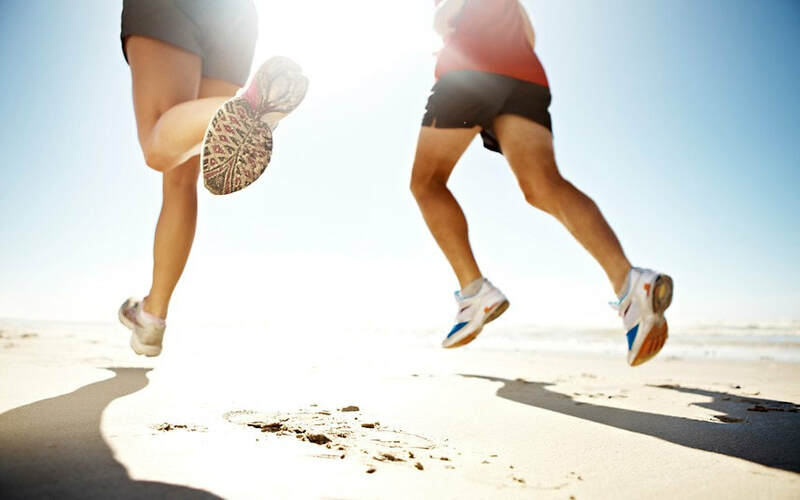 Sand running also allows you to give your calf muscles a good workout without the risk of any impact injuries, and can also reduce the risk of shin splints. The event headquarters is at the Giant Mirrorball on New South Promenade. There is plenty of on-street parking. The Promenade itself is Pay & Display. At race HQ you will find the registration desks where you can collect your race numbers, an enquiry desk if you have any questions, toilets, and baggage storage. There is NO showering or changing facilities at this venue. Entry into the event is open to everyone of all abilities as long as you are aged over 15 on the day of the race (10k), and 11 and over (5k). Online entry is the quickest method and we do not charge a transaction or handling fee for debit/credit cards. The awards presentation will take place back at the registration area at approximately 2.30pm. Please be there to collect your prize as it may not be possible to post or send it on to you. Your running number needs to be collected on race day from the race venue. Registration opens at 11.00am. Please bring your email confirmation or payment receipt with you when collecting your race pack to ensure a swift collection process. You should arrive in plenty of time to avoid queues. There is an enquiry desk if you have any problems or questions about the event. There is also a supply of pins to attach your running number to the front of your running top. The event is timed using our electronic timing system, please see details below. The race venue is the Blackpool's Giant Mirrorball, New South Promenade, Blackpool. The postcode for Sat Nav's is FY4 1RW. The race HQ is clearly signed. There are toilet facilities located within the Solaris Centre. There is also a cafe within the centre. The registration area is marked from the car parks so you won’t have trouble finding us. An area within the registration area will be cornered off for you to store your bag during the race. Avoid leaving valuables, as the area will not be manned during the race. 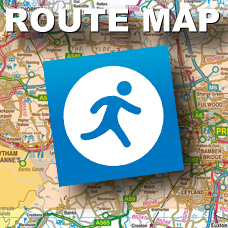 By Car: Exit the M55 at junction 4 and follow the signs for Blackpool Airport. Go past the airport to the Promenade, bearing North towards the Tower. The Solaris Centre is located half a mile up on the right hand side opposite the giant mirrorball. There is a car park at the Solaris Centre but it does fill up quickly. There are additional car parking available on side roads and the Promenade itself but this is Pay & Display. Please park legally at all times. Council Parking Enforcement Officers operate throughout the day. Arrive in plenty of time to allow you to park; collect your running number; get changed and visit the toilet etc. Just before the start the toilets become busy so plan your visit carefully. When you’ve got your running number, fill in the medical information section on the back. Be careful not to damage or lose your number, as replacements can’t be issued. If there’s a risk you may blackout during the race (for example if you suffer from fits), put a red cross on the front of your number. Please pin your number on your FRONT without folding or covering it - it needs to be seen by the race marshals. Do not pass your running number onto somebody else without first notifying registration - this is to ensure the results are correct and for obvious safety and medical reasons. When you are happy that you are ready to run, make your way to the start area. The route to the start point is clearly marked. Line up behind the start line, where there will be a few safety announcements and then the race will start at 10.00am sharp. We advise that you do not wear iPods or similar devices whilst running. You may not hear marshals or indeed fellow runners if they need help! At the finish you will be awarded with your runners medal. Water will be available along with medics, should they be needed. A water station is located at halfway on the route (5k/3miles). Bottled water is available to all runners. The bottle cap will be removed before being passed to you. The station will be clearly signed. Please try and drop your bottles as soon as possible so we don’t litter the course too much. It also helps the crew at the water station to pick the bottles up quicker. Do not use bottled water from the drinks stations to tip over your head as this reduces supplies for runners at the back of the field. A water station is also located at the finish area. Medics are available at the water station and at the finish. If you get into any difficulties on the course you should alert a marshal who will get help for you. You must be fit and well to compete in the event. Severe exertion during or soon after any illness is extremely dangerous. Do not take any chances with your health. If you find yourself in this situation you must withdraw. But do not despair! Email us at least 7 days before the race and we can defer your entry to the following year for free so you do not loose your entry fee.